In our issue of 20 November we referred to Easy Tiger Associates’ client as Lee Cooper, but the brand in question is, in fact, Lee. Quicker from a standing start than Billy Whizz (that’s England winger Jason Robinson to the uninitiated), the Paul Martin Design Company was swept along with the low swinging chariot vibe. On Monday 8 December the Association of Illustrators presents a Contemporary Illustration Auction of works by leading illustrators, as well as future stars, as part of its 30th anniversary celebrations. 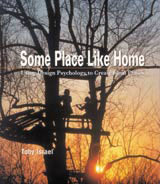 Artmedia Press has helped to design Some Place Like Home, Toby Israel’s design psychology book that will be published next week by John Wiley & Sons.